For this kitchen and bath remodel in an especially small (700 square foot ) Oakland residence, Lejarraga Studio focused not only on upgrading the look and feel, but also on creating a sense of openness and beauty - like a jewel box. The existing kitchen before renovation was dark, dated and cramped. New surfaces, open shelves, lighting and equipment transform the space. Shelves and flooring are made of reclaimed wood, adding to the sustainability of the project. To accommodate the client's request for an additional bathroom off of the bedroom, we designed the tiniest bathroom possible within the realms of comfort and style. 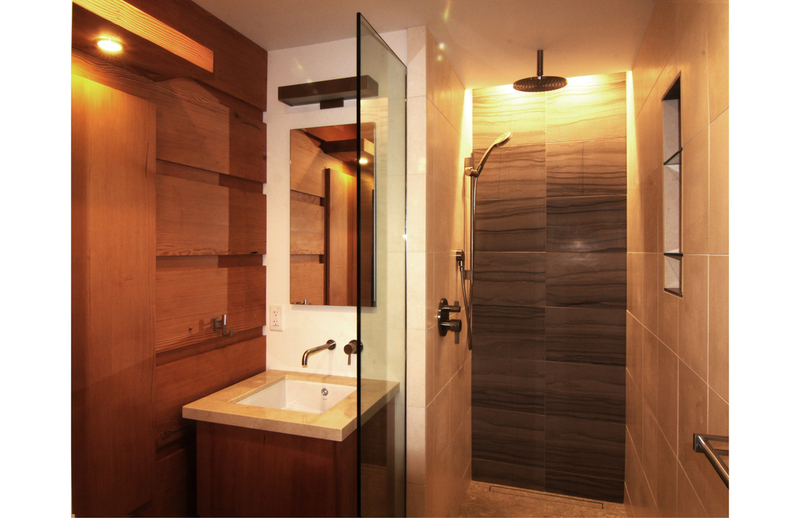 Flat doors, plantings and lighting collaborate to keep the new bathroom discrete.